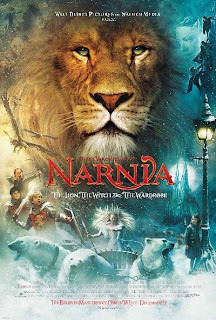 Kingdom of God Media: The Chronicles of Narnia: The Lion, the Witch and the Wardrobe. What a vision C.S. Lewis must have had to craft such a story as The Lion, the Witch and the Wardrobe! The movie version of this story follows the original book quite well, straying mainly in the way it over-emphasizes the end battle between the Narnians and the White Witch's army. Overall, the movie boasts a lot quality visuals that demonstrate tons of spiritual truth. The Narnians have been enduring the cold dead of winter for as long as they can remember. The White Witch reigns over Narnia, despite the fact that most Narnians still believe that Aslan is their true King. Aslan may be King, but the Witch's power over Narnia is still undeniable. The Witch is convinced that she can kill Aslan and thereby assume all power over Narnia for herself. This is true according to all the magic and all the history she has ever heard of. She ends up using Edmond, a proven traitor, as a bargaining chip to maneuver her way into a position of power over Aslan. She has the right to claim Edmond as her own since he is a traitor... she has lordship over everyone who buys into dishonesty and selfishness. But there is one option: Aslan trades his life for Edmond's. Later that night, the Witch binds Aslan to the Stone Table and kills Him amongst a crowd of goons and monsters. At first glance this seems like a miscalculation on Aslan's part; after all, who will protect the rest of Narnia after He is dead? He might have saved one boy's life for a night, but what about when the full force of the Witch's army falls upon the Narnians? Lucy and Susan stay with Aslan's body throughout the night, hardly feeling anything anymore. After the sun rises, they hear the sound of something shattering. Then they notice the Stone Table is broken and Aslan's body his gone! He is standing there beside them, alive and well again! But how? Aslan explains: "though the Witch knew the Deep Magic, there is a magic deeper still which she did not know. Her knowledge goes back only to the dawn of time. But if she could have looked a little further back, into the stillness and the darkness before Time dawned, she would have read there a different incantation. She would have known that when a willing victim who had committed no treachery was killed in a traitor's stead, the Table would crack and Death itself would start working backward." Aslan (Jesus Christ), who was with the Emperor-beyond-the-Sea (God) before Narnia was created, knows a kind of magic that existed before the Deep Magic, or the Law. Though the White Witch (Satan) uses the Deep Magic to oppress and kill, Aslan uses an even deeper Magic to restore life and hope. The Witch uses the Deep Magic to impose perpetual coldness and fear upon the Narnians but Aslan entered the scene to restore warmth and freedom. Aslan (Jesus Christ) overpowers and atones for the consequences of the Law by the authority He has had since before either the Witch (Satan) or the Law ever existed. Disney released their movie version of The Lion, the Witch and the Wardrobe two or three years ago. Inspired by this film's success, they decided to make another rendition of Chronicles of Narnia: Prince Caspian. I would highly recommend reading the entire Chronicles of Narnia series. Not only are the books geared for young readers and are therefore easy to read, every story is packed with an astounding depth of spiritual significance. I remember the first time I read all the books as a child, and several times since! I enjoyed the movies but they will never compair to reading the books. C.S. Lewis was truly an amazing author. i do hope narnia will be utterly different from harry potter when it comes to movies..i read HP and the outcome of the latest movie was very poor for me..if i read the chronicles, i do hope i won't be disappointed with the movies.. I recommend the very recent and utterly excellent Planet Narnia by Michael Ward. Best publication on Lewis I've EVER seen. Watching the Prince Caspian movie inspired me to read the books again; I don't think any movie will ever be what the book was, but they did honor what C.S.Lewis was saying, and made an excellent movie, too. I've collected the entire Narnia series since I was a kid, but apart from the 2nd, 3rd and last book, i can't find any other link to the bible... what do you think? Definitely -- everyone needs to read the Chronicles of Narnia. what you say is surprising... the first book, The Magician's Nephew, for example is loaded with Biblical themes, especially about creation. Lewis expounds on creation in such a wonderful and insightful way that i can't help but give credence to his explanations. I can't remember a lot of the the other ones... but there are a lot of themes that allude to church history at least. An overall purpose in Lewis' writing, i gather, is to illustrate to depth and width and height and breadth of God's mind, and how much more there is to Him and His creation than most people care to think about. I remember being a huge fan of the books. C.S. Lewis was simply an incredible author. when I went and saw this and Prince Caspian I was impressed! Great movies, but not as good as the books.